The company has registered new sales area of 3.38m sq ft valued at 20.12bn at an average price realisation of Rs. 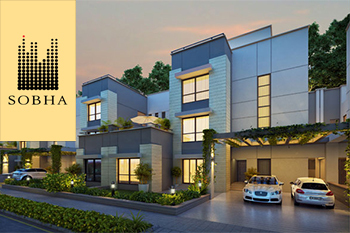 5946 per sq ft.
Sobha Ltd was trading 4% higher at Rs. 281.The company has registered a new sales area of 3.38m sq ft valued at 20.12bn at an average price realisation of Rs. 5946 per sq ft. The scrip opened at Rs. 275 and has touched a high and low of Rs. 283.4 and Rs. 274 respectively. So far 33909(NSE+BSE) shares were traded on the counter. The current market cap of the company is Rs. 2658.41 crore. The BSE group 'A' stock of face value Rs. 10 has touched a 52 week high of Rs. 467.9 on 10-Apr-2015 and a 52 week low of Rs. 230.05 on 25-Feb-2016. Last one week high and low of the scrip stood at Rs. 279.2 and Rs. 266.1 respectively. The promoters holding in the company stood at 60.58 % while Institutions and Non-Institutions held 34.76 % and 4.66 % respectively.